Early production M5A1 (British designation "Stuart") light tank. 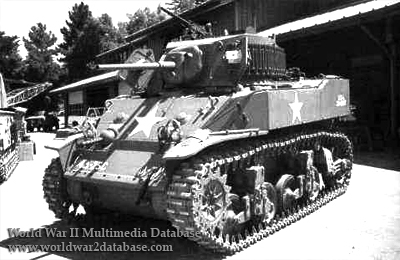 Despite the inability of the Stuart series to compete with German armor, a new version in 1942, the M5, featured the M3A1 turret, welded armor and two Cadillac automobile engines. The previous versions used a radial aircraft engine that was in high demand; the Cadillac engines helped to relieve supply constraints. The M5 retained the 37mm (1.46 inch) gun found in the M3 series. This M5A1 has the M3A3 turret, which moved the radio into the turret for better access. The M5 served in the British, Commonwealth, and American armies, but was refused by the Soviets, who disliked the M3 because it lacked armor and firepower and was sensitive to fuel quality. Despite being obsolete against German tanks, the M3 was successful in teh Pacific, where Japanese tanks were rare, and if encountered, usually unable to defeat the Stuart's armor and gun.